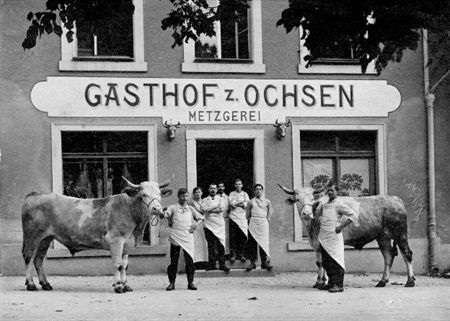 The Jenzer butchery can look back on a tradition spanning over a century, having had a store in Reinach since 1977. It is held in the highest regard by its customers from the entire Birseck area. Almost all meat and sausage products are produced in-house and sourced exclusively from regional suppliers. As a result the team offers a wide range of local specialities such as the Jenzer Goldwurst (the golden sausage), the Coq au vin pie or the Jenzerli (a most delicious version of the Frankfurt sausage). Seasonal delicacies include locally sourced game in autumn or turkey at Christmas. Customers of course can choose from a great range of butchery staples such as steaks, filets, salami, cold meats or poultry. The offering is enhanced by local beers, homemade salads, Traiteur items or Swiss pasta to name just a few products available. All members of our brass band rave about the friendly and personal service we receive every time we visit Jenzer in Reinach or their other stores in Arlesheim and Muttenz. And of course you will see Jenzer at events big and small in our area selling the best Cervalat and Bratwurst. Jenzer is open from Monday to Saturday and thanks to Reinach360.ch you can have a look at the Jenzer butchery in 360°.